The Construction Master Pro Trig calculator provides construction professionals with complete trig functions to help them quickly and easily solve complex construction-math problems. It saves time, reduces costs and prevents re-work. You can effortlessly work in and convert between feet-inch-fractions and metric units. Instantly calculate complex construction challenges for stair layouts, roofs, framing and much more. Full trig functions with sine, cosine, tangent, arcsine, arccosine and arctangent. 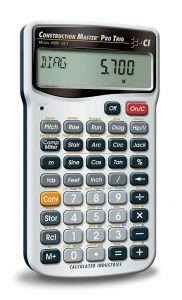 A more compact version of its desktop sibling, the handheld Construction Master Pro Trig calculator 4080 from Calculated Industries is the most complete construction-math calculator on the market. Offering powerful built-in solutions and expanded preference settings, it's perfect for completing layouts, bids, and estimates as well as helping to save time and money by helping you figure out the right amount of needed materials. It's ideal for or contractors, architects, builders, engineers, project managers, estimators, draftspersons, and more. You'll be able to work in and convert between all building dimensional formats--yards, feet-inch-fractions and metric including area and volume. And it also comes with a full trigonometric functionality (sine, cosine, tangent, arcsine, arccosine and arctangent simplify complex design and construction-math). 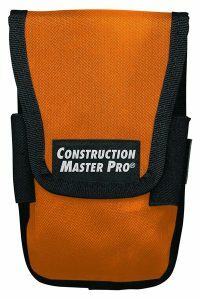 The Construction Master Pro includes a number of built-in time-saving functions, including calculations for risers, treads, stringer length, and incline angle; how many 4x8, 4x9 or 4x12 sheets are needed to cover an area; jack rafter results for regular and irregular pitch roof; determining number of on-center studs for an entered length; and right angles. It also offers advanced solutions for circles, arches, columns, cones, pillars, windows and post-holes arcs, circumference, and segments. The Construction Master Pro Trig also includes the ability to custom define your preferences (such as fractional settings), a "paperless" tape that lets you review the previous 20 entries to double-check your totals, and accumulating memory with three additional memory storage locations. I am an architect and have used many "foot/inch" calculators over the years and this is hands down the best I have seen. I let an employee borrow it recently for a large dimension verification effort on a project and let him keep it as a thank you for the effort he put forth in finding the discrepancies we had in a project we were working on together. But this meant I needed to get a new one; I also bought the iphone app of this same calculator to keep with me at all times. I am a pipefitter & this calulator is great for calulating compound offsets & related items like chord lengths.If you have a math problem this calculator can do it.Its also very easy to use.Its a must have Item for the pipefitter/Welder. The company I work for builds and repairs API Aboveground Storage Tanks. We go around in circles every day all day long! The Trig functions and the conversion functions are fantastic! We have purchased 7 Construction Master Pro Trig calculators for each of our employees and will purchase more as we hire new people! This is the forth calculator like this I have bought. One a different brand and the other 2 have been from Calculated Industries (Maker of the construction master pro) and this has been the best one so far. I love it's ability to handle feet and inches, built in trig (pich/rise/run calculation) that way I don't have to remember the sign cosign and tangent and how to use them. Built in circular calculations, ability to convert between metric and imperial (feet and in). There are several other functions that are cool, but I do not use, like the ability to figure stairs, figure a compound miter, ex. If you are looking for a calculator for a job site, or as a draftsman in my opinion you can not go wrong with this one. These calculators are great. The armadillo casing tops its excellence. The only issue is that if you use it day in and day out, the buttons wear out within a year. User: Paul Rabinowitz of PRB Design, Inc.
Just want to say that I bought a Professional Measure Master II about 27 years ago. I used it for about 10 years and then bought the Construction Master Pro Trig and put my original calculator in a drawer. Well, about 17 years later (recently), I found it in a drawer and the battery still works! I've used it daily for the last few months now and it's still going strong. Unbelievable! Thanks for a great product. I have been using Calculated Industries calculators for at least 20 years. I bought them for all my employees so they would stop wasting time and be more accurate. I am lost without my Construction Master Pro Trig. 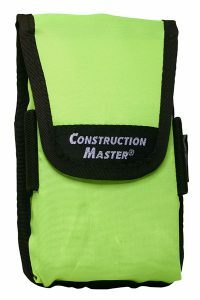 A great tool in the office and on the construction site.